EN: Exactly two years ago I was living my dream in Australia, Sydney. Vivid Sydney brings back all the memories from Australia and especially the beautiful ones of the beginning of my "French story." Today is the official start of this year's festival of light, music and ideas. Spectacular projection on the Opera house starts every evening at 6pm till midnight for three weeks. I remember walking around the area of Circular Quay and The Rocks on warm evenings, sipping wine with my friends and watching the lights with eyes wide open. I will never forget Australia. 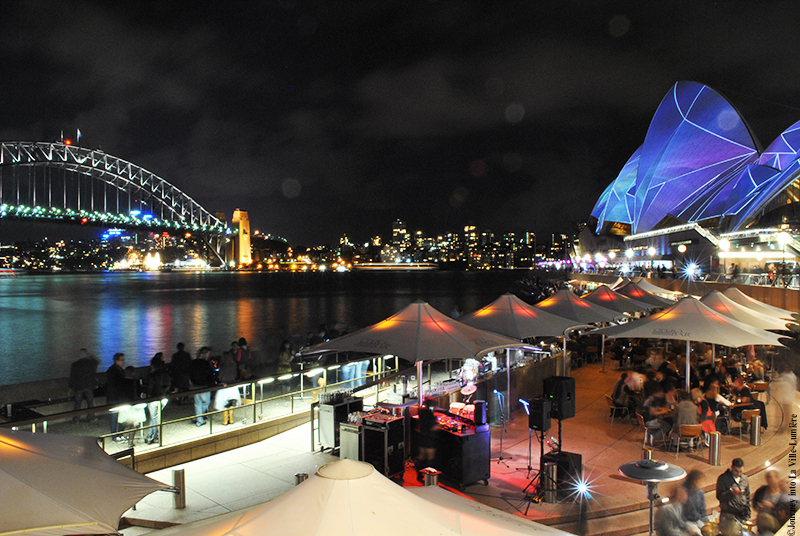 For more information you can visit the official website for Vivid Sydney. SK: Presne pred dvoma rokmi som zila svoj ​​sen v Australii, Sydney. Vivid Sydney mi pripomina vsetky zazitky z Australie a hlavne krasne spomienky na zaciatok mojho "francuzskeho pribehu." Dnes je oficialne otvorenie tohtorocneho festivalu svetla, hudby a napadov. Velkolepa projekcia na strechu Opery zacina kazdy vecer o osemnastej hodine do polnoci, po dobu troch tyzdnov. Spominam si na prechadzky okolo Circular Quay a The Rocks pocas teplych vecerov ked som popijala vinko s priatelmi a spolu sme obdivovali tie nadherne svetla s ocami otvorenymi dokoran. Nikdy nezabudnem na Australiu. Pre viac informacii mozete navstivit oficialnu stranku Vivid Sydney.